On this Tuesday, I decided to talk about batteries, you know the ones that run your car. The Hudson Motor Car Company was the first to use a standardized battery in 1918 when they started using the Battery Council International batteries. The BCI is the organization that sets the dimensional standards for batteries. Cars had 6-volt until the mid-1950’s. As cars got bigger with more demands on the battery they created 12-volt. 1. Keep the battery terminals clean and inspect regularly (i.e. monthly) for corrosion. 2. Start the car before operating car accessories and operate (drive) the car to allow the battery to get topped off by the car alternator which produces electricity and as a by-product charges the car battery after voltage drops in the battery. 3. Keep the battery secure and free from vibration. 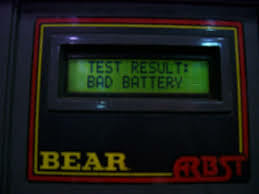 Batteries that shake can become damaged and short circuited or worse cause damage to your car. 4. Insulate the battery from extreme temperature changes with a car battery insulation kit. These usually come with new cars already, however you can find replacements specifically made to fit your car’s battery compartment. The sleeves are usually plastic or an acid resistant/thermal resistant material that insulates your battery but still allows it to vent. 5. Invest in a car battery charger that will maintain an optimum charge level when your car is not in use or when you go on vacation.